The Cincinnati Rollergirls swept their home season opener on Saturday, March 23, pulling off an 128-104 upset win over the Brandywine Roller Derby Belligerents in sanctioned play and then punctuating it with an even bigger 211-99 B-team victory. Ranked No. 88 in the WFTDA, the Cincinnati Black Sheep were not favored to beat the No. 80-ranked Belligerents. But the Black Sheep appeared to have learned some lessons from recent losses to three other higher-ranked teams, solidifying their defensive strategy, jammer rotation and overall teamwork to roll to victory on Saturday. Saturday was the Belligerents’ first sanctioned game of the season, but they put up an impressive fight against the Black Sheep and remained within striking distance of a win for nearly the entire game. In the B-team matchup between CRG’s Violent Lambs and the Brandywine Brawlers, both rosters included skaters that had previously played in the sanctioned game, but the Lambs leaped out to an early lead and never looked back. 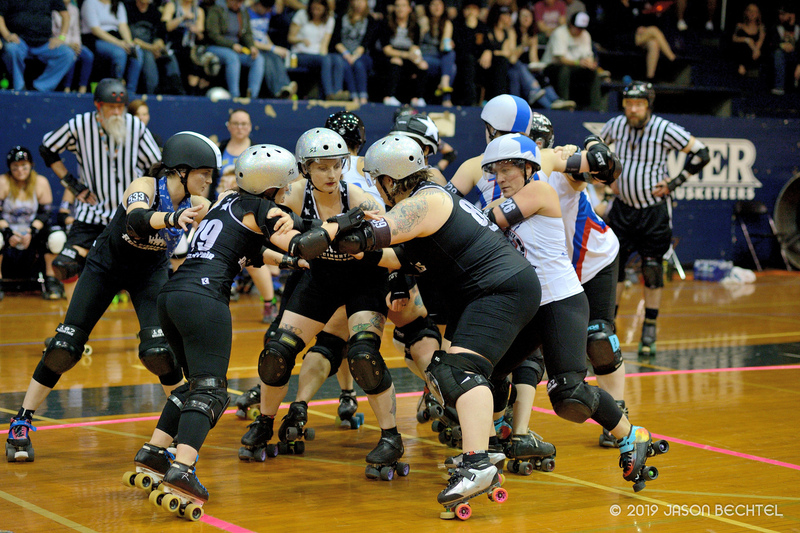 The Lambs bench coaches gave all but three of their skaters a chance to wear the jammer star, and rookies Motley Crouton and Ursa Maimher got their teammates on their feet as they put up their first points in their first-ever CRG game. CRG takes on Steel City Roller Derby in a double-header at Schmidt Memorial Fieldhouse on Saturday, April 6, the team’s annual Superhero Night. For tickets and more information, click here.